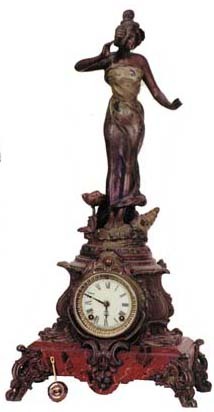 Ansonia Clock Co. "Cyruric and No. 1176", ca 1904. The red base that looks like marble is metal painted to resemble marble. Statue and base were primarily red and green originally, now some of the finish has worn from the statue, base still retains a great deal of the red and green, just dirty.8 day movement, striking half hours on a gong, running. Porcelain dial and beveled glass. The clock is 24 inches high and 11 3/4 inches wide at the base. Ly-Ansonia No.1480.